. : Lee Hawkings :: Ski XCOttawa.ca :: Skiing in Ottawa and Gatineau Park :. Lee is entering his third year in Ottawa. He drove here in 2009 from his home town of Whitehorse in his 1992 Toyota Privia. Lee loves to travel and has traveled to the World Junior Orienteering Championships the past two years in northern Italy and Denmark. 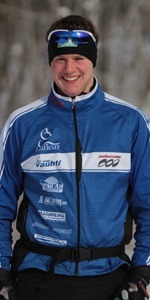 His notable ski results include 3 top tens at the 2009 National Championships and in 2010 he placed 5th at the World Junior Trial sprint races in Canmore. This year he hopes to make a successful transition to racing in the senior men’s category. Lee is currently taking environmental science at Carleton. Lee also enjoys hiking, paddling, kite skiing, downhill skiing, mountain biking and pretty much anything else you can do outside. Other Pursuits: Orienteering, mountain biking and pretty much anything else outside.